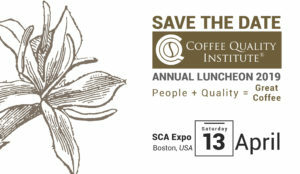 Find CQI staff members David Roche, Lisa Conway, Tina Yerkes, Mario Fernandez, ChengCheng Su, Monica Bolek, and Emma Sage at Re:co and listen to board member Ellen Jordan Reidy talk about 20 years of work with CQI and the many lessons learned that are relevant in today's coffee world (session three). Connect with our staff, pick up your pins, and hear about all the great things CQI has been working on since the last Expo. We will be out of the booth between 11:30am and 2pm on Saturday, April 13th during our Annual Luncheon. Below are additional events CQI will be participating in and are open to the public. "Demystifying Processing Trends: The Myths Versus Science"
Cupping the winning coffees from the Philippine Coffee Quality Competition. Sign up for our newsletter today OR ELSE... you might miss something important.